Cosonok's IT Blog: CIFS Terminate and NFS Off Before 7MTT CBT Cutover? CIFS Terminate and NFS Off Before 7MTT CBT Cutover? Q: If we terminate CIFS and NFS before our 7MTT cutover, is the NAS configuration (of shares, exports, and other NAS stuff) transitioned? Really, it doesn’t matter, since the configuration is applied when you click ‘Apply Configuration’, the ‘Complete Transition’ button just cuts the volumes over. Image: CIFS and NFS are not running prior to cutover. 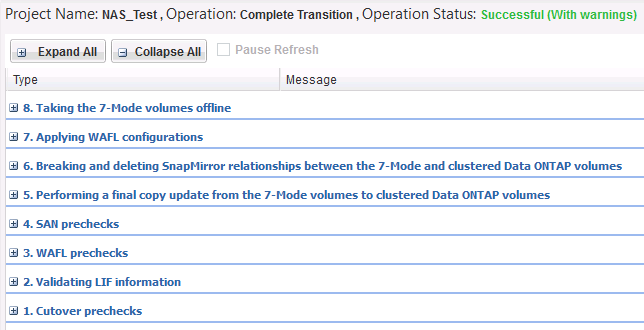 And click the ‘Complete Transition’ button to perform the ‘Storage Cutover’. And we’re going to take source volumes offline. And the cutover is all successful. 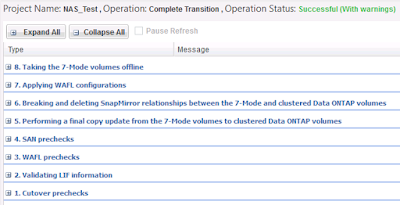 Image: Successful 7MTT CBT NAS cutover with NFS and CIFS disabled. The CFT workflow has an ‘Apply SVM Config’ button, it doesn't have CBT’s ‘Apply Configuration’ button, The button names are subtly different. This makes me think that the volume configurations (shares, exports, etcetera) are exported in 7MTT CFT's 'Export & Halt' phase, so CIFS and NFS do indeed need to be running on the 7-Mode system prior to cutover.